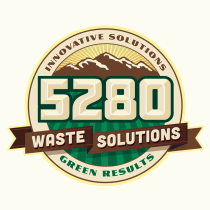 Founded in 2012, 5280 Waste Solutions has grown to be the leading roll-off service provider in the Rocky Mountain West. As its standards for achievement, the company credits relentless focus on customer satisfaction, technical innovation, and a deeply held belief in community participation. With the roll-off service provided, 5280 strongly feels it can double the community benefit by taking a leadership role in ground-breaking improvements, creating a better environment for our future. 5280 strives to be an example for others by demonstrating active leadership for both the community and the environment.